OMG!!! We actually made it through Season One!! Ok so it took us about as long as Kirk’s complete five year mission, but we completed Phase One of what started off as a fun little idea concocted over Bailey’s-infused coffees on a Christmas morning long ago. To finish the season, we had to deal with Kirk dying (Oh wait, that’s his twin brother, right? No, just his brother who looks exactly like him. I’m just confused now…), Kirk’s sister-in-law dying, and Kirk’s nephew apparently being sent to live in an orphanage for the rest of his childhood (“Sorry, there’s no room on the Enterprise for a snot-nosed kid.” -Kirk). Oh yes, and did we mention LOTS OF FLYING VOMIT?!?!?! 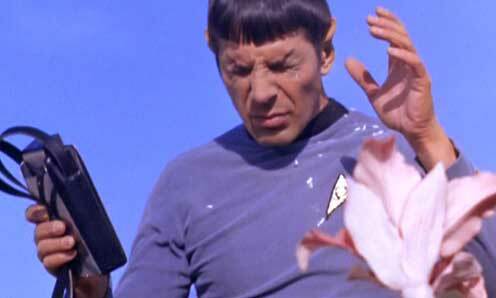 And that Spock GOES COMPLETELY BLIND?!?!?! Are you afraid of scabs on fishing line? Does the sun set you free? Do you have inner eyelids? Let us know your thoughts in the comments or send us an email at StarTrekQuest@gmail.com. download the MP3 file here. An award-winning classic Star Trek episode? You mean we’re not the only ones who think Star Trek really does have some great plots? Generally regarded as one of the all-time best Star Trek episodes, this episode features a gorgeous Joan Collins as possibly the one true love of Kirk’s life (Kirk exempted of course). 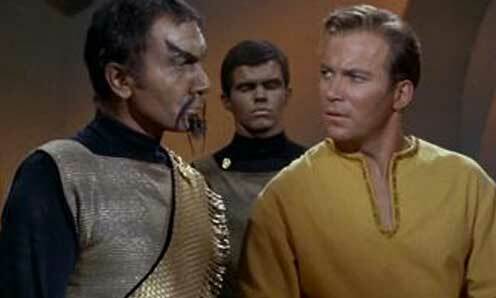 Some funny Spock humor, some over-the-top demented Bones acting, and a genuinely soul-crushing Kirk decision makes for a surprisingly effective combination. Could you build something from stone knives and bearskins? Do you own a few pounds of platinum? Do you dig Joan Collins’ accent? Let us know your thoughts in the comments or send us an email at StarTrekQuest@gmail.com. The Klingons are back – and this time it’s going to be all-out war! At least, until a glowing space angel shows up and spoils all the fun. This episode shows Kirk at his most aggressive. He just can’t handle the idea of a pacifist society. He’d rather get the whole planet blown up than bow down to anyone, especially a dude in a shiny shirt. Why do Klingons have such cool facial hair? Why are the goats green? Let us know your thoughts in the comments or send us an email at StarTrekQuest@gmail.com. So it starts with an amorphous pizza-shaped blob. That can burrow through rock. And spit acid. Actually, that’s what the whole plot of this show is about. Slowly learning that the pizza thing may be more human than the humans. If you were to make an alien costume, what would it look like? Would it be as weird as this thing? Would Spock grok it? Let us know your thoughts in the comments or send us an email at StarTrekQuest@gmail.com. 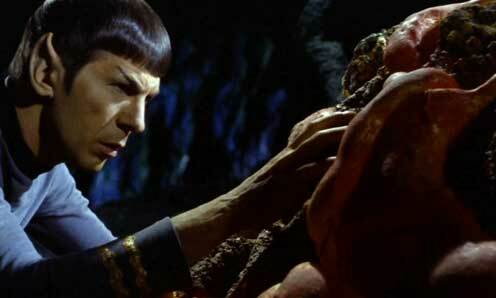 Peace, love and happiness flow through Spock’s green veins after being assaulted by a molesting spore plant. He smiles, hangs from a tree like a monkey, and gets to make out with a hot blonde. You go, Spock! Of course, party-pooper Kirk can’t let anyone have any fun, so he throws a fit and calls Spock a dog-faced boy. How rude! In one of our shortest podcasts to date, we burned through the plot and spent more time talking about the incredible capabilities of the spore plants. Logic score be damned. Have you ever been spored? How could a plant fly through space? Why does Spock get so much love from the ladies? Let us know your thoughts in the comments or send us an email at StarTrekQuest@gmail.com. A super-being from an alternate past sleeps his way into Kirk’s universe, seduces his historian, and decompresses him into a near-vacuum. The TrekQuesters had a fun time discussing Bones’ insane courage in the face of having his arteries sliced open, super women performing yoga, and that weird plastic thing that Kirk beats Khan with at the episode’s end. Did we all miss a huge war in the ’90s? Are all historians potential traitors? Is Khan stronger than Spock? Let us know your thoughts in the comments or send us an email at StarTrekQuest@gmail.com. Wars being fought by computer really sounded like a great idea until this episode came along and ruined it. Instead of being shot or gassed or nuked, just walk into a spinning closet and you’re painlessly disintegrated! Such a civilized concept could have lasted forever if Kirk hadn’t shown up and started blasting everything is sight. This episode is actually a pretty smart sci-fi concept, exploring the idea of warfare and its related deaths becoming so technical they become a mundane part of everyday life, neither feared nor avoided. The show also has one of the coolest classic Trek sets, with a computerized scanning station complete with spinning radar viewer. Not too shabby considering the less-than-stellar budgets of the ’60s. Are you a casualty statistic? Are diplomats completely useless? 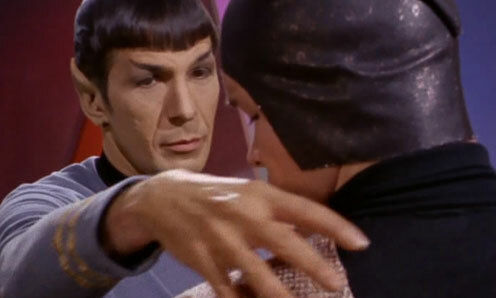 Have you heard Spock tell Uhura to sit on a scantily-clad alien? Let us know your thoughts in the comments or send us an email at StarTrekQuest@gmail.com. So, you’re standing on a street corner with a friend, minding your own business, when suddenly three dudes in cloaks carrying long, hollow tubes approach you from multiple directions. Do you call for help? Run away? Convert to a new religion? The Star Trek answer: all of the above! LANDRU!!! Part Kramer-haired holographic cult leader, part schizophrenic computer! Join the body! Become filled with peace, and joy, and experience glorious pre-planned acts of violence! What a lovely planet we have to visit this week. Unfortunately, our own L-Andrew wasn’t able to make this, but we had plenty of fun both at his expense and in his absence. Can you destroy a computer — with a logical loop? Can a sparkler shoot from a hollow tube? 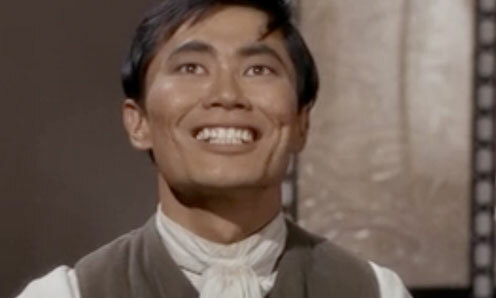 Was George Takei completely high for this show? Let us know your thoughts in the comments or send us an email at StarTrekQuest@gmail.com. A Viet Nam era jet is scrambled over U.S. airspace to check out a time-travelling UFO, leading to the TrekQuesters’ highest rated episode to date. Combining one of the best Kirk fights ever with a big dose of geeky Trek humor, Tomorrow is Yesterday is a great example of the things we love most about ST:TOS (with the notable exception of attractive female yeomen and/or aliens). With this first plot focused on time travel, Star Trek makes a big leap into one of science fiction’s great “final frontiers.” Is time travel actually possible? We’ll leave that to future physicists to figure out. 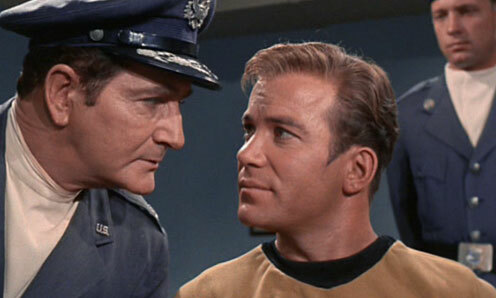 But is a time-travelling Kirk neck-flipping a 1960s security guard hilarious? Yes, yes it is. Will you be part of the first Saturn mission? Is Spock capable of making a mistake? Do you believe in little green men? Let us know your thoughts in the comments or send us an email at StarTrekQuest@gmail.com. Imagine you have a twin. Now imagine you really don’t like your twin. 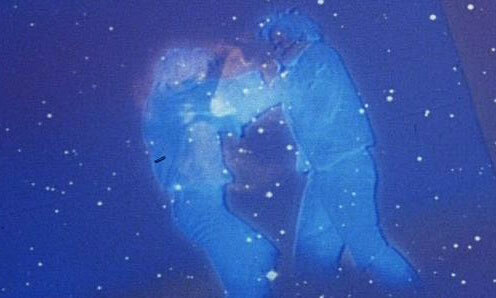 Now imagine you and your twin are engaged in eternal combat in a psychadelic blue-tinted alternative universe. Add in some horrible facial hair and a Jetsons-style space pod, and you have a nearly complete description of this episode. Yes, it’s awful. 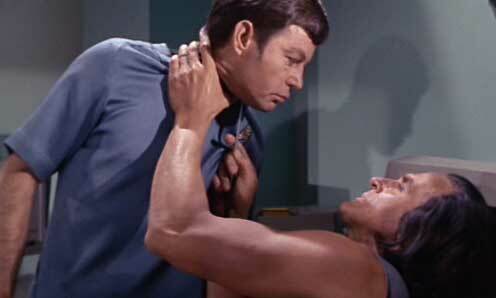 Even by Star Trek TOS standards, this show makes almost no logical sense. Still, it turned out to be one of our favorite podcasts to date, led by Dad and Andy’s gleeful demolition of every aspect of the plot. Biblical Lazarus: Raised from the dead. Star Trek Lazarus: Dead on arrival. Are you the devil’s own spawn? Have you ever winked out? Could you write a better Star Trek screenplay than this — in your sleep? Let us know your thoughts in the comments or send us an email at StarTrekQuest@gmail.com. Episode 9: What are Little Girls Made Of? TrekQuest is not endorsed, sponsored, or affiliated with CBS Studios Inc. or the "Star Trek" franchise. The Star Trek trademarks, logos, and related names are owned by CBS Studios Inc., and are used under "fair use" guidelines. Original content copyright 2012.